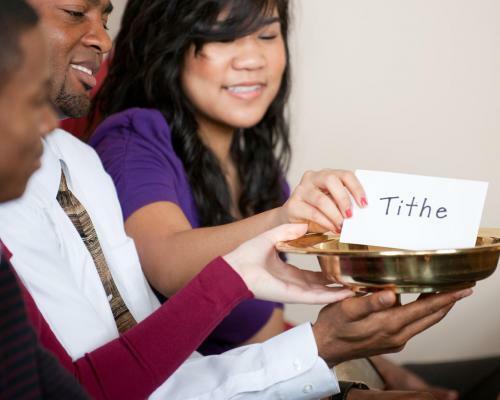 Adventist Stewardship | Scarcity or abundance? Although I became a Christian about the time I left school, I knew little of God's heart concerning money and the abundant resources of His provision. Through my early working life, my days as a theology student and the first few years of my ministry, this attitude dominated my approach to money. Ten years passed and the opportunity came to study at Andrews University in Berrien Springs, Michigan, United States. It was an enormous choice to make because only the course fees would be met. We had to find our own fares and living expenses somehow. My wife and I discussed it in depth and finally decided to go. It involved selling everything we possessed and converting it to cash. It was a strange thing seeing every stick of furniture we owned being carried out the door by someone else. It was winter when we arrived and already snow covered the ground. Realising we would need transport for the next four years, we budgeted $1000 for a car. At that time it was possible to buy a roadworthy, gas-guzzling monstrosity for that price. But when I went to insure it, the agent wanted $900 for one year's premium. "How come?" I asked. "Well, you drive on the opposite side of the road where you come from and the roads are slippery with ice at this time of the year. You are a walking recipe for disaster!" he replied. No way, I thought to myself. I walked out and had a heated conversation with God. My mentality of scarcity took over again. "Lord, I've come halfway around the world with a limited amount of money that has to last for a long time. This is Your work before it is mine. I want to insure this car with you. Will you promise to look after it? After all, haven't I always been faithful in my tithe paying? I'm going to claim the same sort of promises that I've read in Uncle Arthur's Bedtime Stories. I'm going to put You to the test you've challenged me to make in Malachi 3:8-12." Three months went by and the car needed servicing. In particular, the carburettor needed attention and one of the students, who was a mechanic, offered to do it for me on the following day. But, unbeknownst to me, he came and removed the part that day. My wife asked me to go down to Apple Valley Market and buy a few groceries, so I called my youngest son to come with me. There must have been just enough petrol in the system to turn the motor and, within moments, fire leapt through the dashboard as petrol ignited on a hot engine. I grabbed my son and we stood by helplessly watching the precious car become totally gutted. The fire brigade came but it was too late. Students in Beechwood apartments where we were staying came from everywhere to watch the blaze. God and I had another heated conversation. "What on earth are you doing?" I shouted. "I thought we had a deal going between us. I did my part paying tithe but you haven't done your part rebuking the devourer!" But then an amazing thing happened. During the week that followed, unknown people slipped envelopes under the door of our little apartment, containing money--some small amounts, some large. Even some staff members on the faculty did the same. When we finally counted it all up, it was exactly the price of the car. God was doing more than honouring a promise. He was dealing with a deeply lodged misconception in my psyche about His way of operating. It was as if He was saying, "I can take it away and I can give it back. I am the God of all resources, and I can meet your needs if they align with My purposes and My will." Something shattered in me that day. While I am still not reckless in spending these days, I no longer have a mentality of scarcity. I know from personal experience that the God who owns the cattle on a thousand hills can supply all my needs when He sees I have such a need. Life will never be caviar and champagne for me but my basic needs for His service are always met. For all the animals of the forest are mine, and I own the cattle on a thousand hills. . . . Trust me in your times of trouble, and I will rescue you, and you will give me glory. Psalm 50:10, 15. Graeme Loftus pastors the Charlestown church in the Newcastle region, New South Wales.